View More In Needle Valves - Page 4. A precision molded, replaceable Delrin soft seat is the key to the bubble tight seal of the soft seat valve. Typically used in gaseous application, this valve will provide years of dependable, trouble free service. 6000 psi pressure rating at 200 degree F maximum. Replaceable Delrin seat and straight through porting for bi-directional, high capacity flow and easy roddable cleaning. Viton O-ring seal and Teflon back-up ring below the stem threads to protect from corrosion and galling. All stem threads are rolled for strength and ease of operation. Bonnet lock pin to prevent accidental loosening. Vinyl bonnet and stem dust cap. 0.187" orifice size. 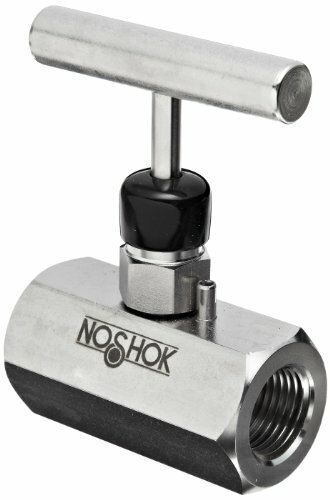 If you have any questions about this product by NOSHOK, contact us by completing and submitting the form below. If you are looking for a specif part number, please include it with your message.